Product Code: 82888 Can we buy spare lids for these two handed mugs? Unfortunately, we cannot supply the lids seperately for these. 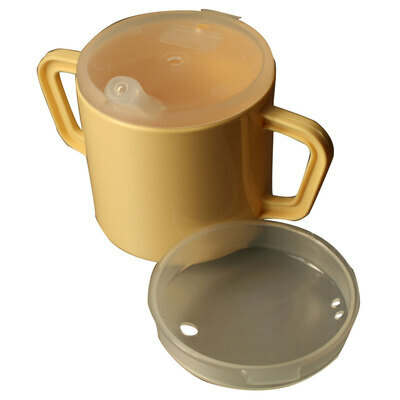 Designed to help promote the independence of your residents, our Twin Handled Mug with Feeding and Narrow Spout Lids are perfect for care home environments. Each one has a durable plastic design that can be sterilised to temperatures up to 135-degrees centigrade. They are microwave friendly and dishwasher safe with a specially designed lid. It offers 3 drinking holes and a controlled flow system to increase the chances of non-spill drinking. The mug has a twin handled design for easy grip and the option of two spouts. Here at Gompels, we have a wide range of Feeding Cups & Aids to suit your business. Consider adding our Polycarbonate Mug, Maroon Spoons or our Incurve Plate Surround to your basket today and create a relaxing dining experience for all your residents.